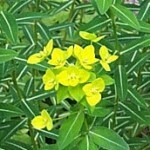 Wallich spurge is a clump forming herbaceous perennial native the Himalayas. It is a member of the spurge family, Euphorbiaceae, that also includes poinsettia, caster-oil plant, and cassava. The lanceolate leaves dark green with a white midrib before turning yellow or orange in the fall. The flower-like structure appears terminal clusters in early spring and lasts for months. It is four to six inches across, lacks sepals or petals, and consists of three yellow bracts surrounding a cyanthium that is formed by the fusion of a single stamen (male) and a long stalked ovary (female). The stems are coral red and contain a milky sap that may be irritating to the skin and eyes. Care: Cut back flowering shoots to ground level in late summer or autumn.